In my last entry about the Kindle I discussed how magazines could be the "killer-app" for Amazon's Kindle. The Kindle holds amazing promise for reducing the carbon footprint of publishing, but to do that the Kindle first needs to get really popular. Amazon still has some work ahead of them before the Kindle is a raging success. 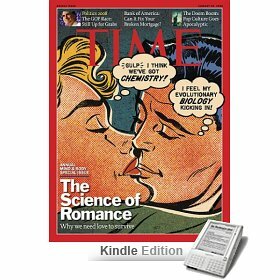 Read on for some simple ideas for how Amazon can use magazine content to make the Kindle a hit. Currently only 8 magazines are available for the Kindle, they need more, a lot more. If people can replace many, if not all, their print subscriptions with Kindle subscriptions, they'll be much more likely to get a Kindle. Popular texty magazines like the New Yorker, Harpers and the Economist would be great on the Kindle. Techy and business magazines, like Wired, PC Magazine, Fast Company, Smart Money, etc, could also be really popular as readers of those magazines are probably familiar with the Kindle and interested in trying it out. Travel and outdoors magazines also seem like a good fit. Also, Amazon should make it really easy for publishers of any size to make their periodicals available for the Kindle (think Amazon MarketPlace, or iTunes for PodCasts). The Kindle is great for text, but since it's only grayscale, it's not so great for images. The is a serious limitation for magazines that rely on photography and other artwork. One way to get around this is for Kindle Magazines subscriptions to include a full color edition which can be viewed on a new Kindle desktop reader application. Such an application would also be great for managing users' libraries and syncing content (much like iTunes for the iPod). Also, with a desktop Kindle Reader application people wouldn't need a Kindle to buy Kindle magazines. Just like you don't need an iPod to shop on iTunes, you shouldn't need a Kindle to buy Kindle content. But just like iTunes helps drive iPod sales, the Kindle application could help Kindle sales. Amazon should advertise in printed magazines that are available for the Kindle and emphasize the free 14-day trials of Kindle Magazines (if they haven't already). Adds in public transit also seem like a good fit for the Kindle, as it should be popular among commuters and travelers (they're probably doing this already). Subscribers of the print version of a magazine should get a free one year subscription of the Kindle edition. After that first year, the electronic subscription should be heavily discounted for print subscribers. The idea here is to try to ween people off the printed issue, which shouldn't be very hard if people are given the opportunity to try it out for free and get used to it. This probably goes against everything Amazon stands for, but it should consider selling the Kindle in retail stores and kiosks in malls and airports. I'm sure a lot of people are skeptical about the quality of the screen, and allowing people to see it first hand will surely put to rest any concerns about the readability of the screen. Also because content can be downloaded wirelessly, the Kindle could be quite useful right out of the box. So people in the airport may be willing drop $400 on it right then and there. Amazon could partner with Sprint (the provider of the Whispernet) and have Kindle on display in Sprint Stores and Kiosks.